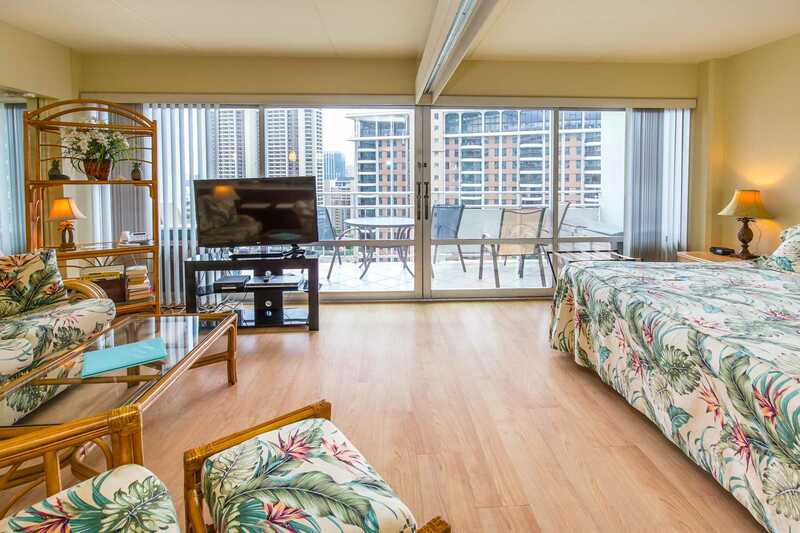 "Great location (just out of the crazyness of Waikiki), amazing view of the fireworks, great option of family or quiet pool (with plenty of umbrellas). Having the full kitchen was very handy." 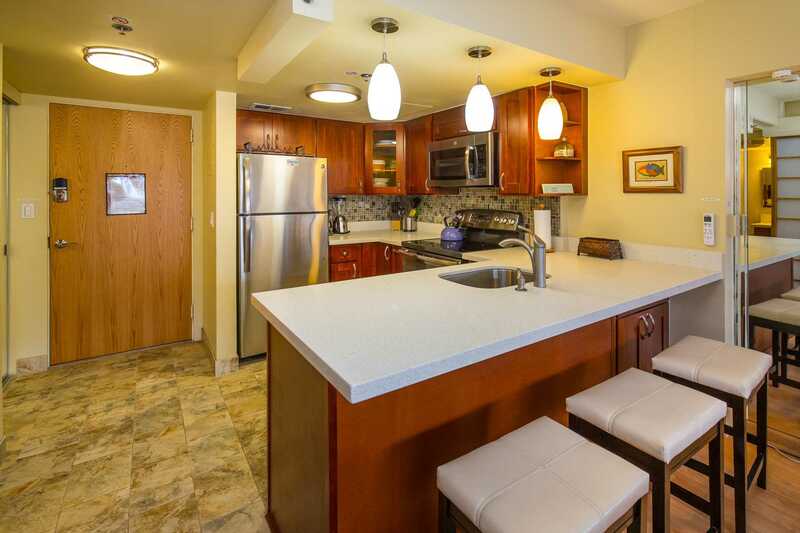 Loved everything about our condo...perfect location, breathtaking views and fully equipped kitchen made it a very comfortable stay. We really enjoyed the extra beach chairs too. Would definitely book here again. Location, location, location. We had a great eight night stay in 1938 and loved it. 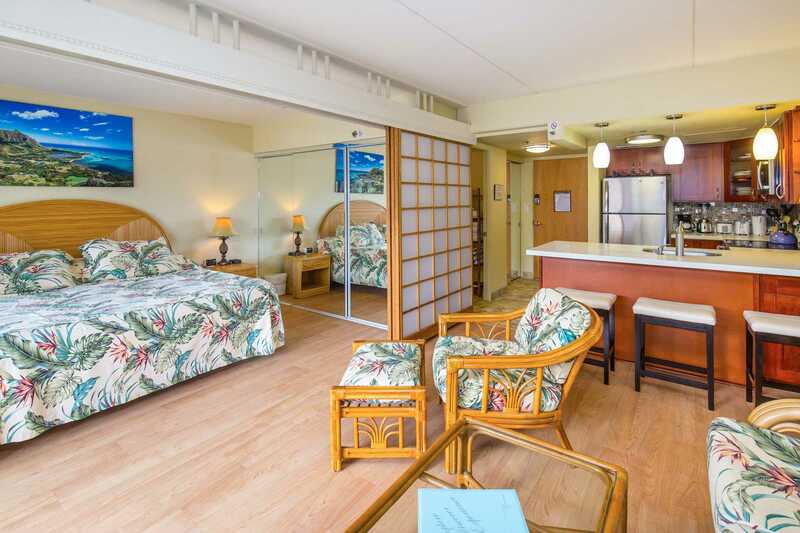 The unit had a comfortable bed, large lanai and nicely updated kitchen and bathroom. 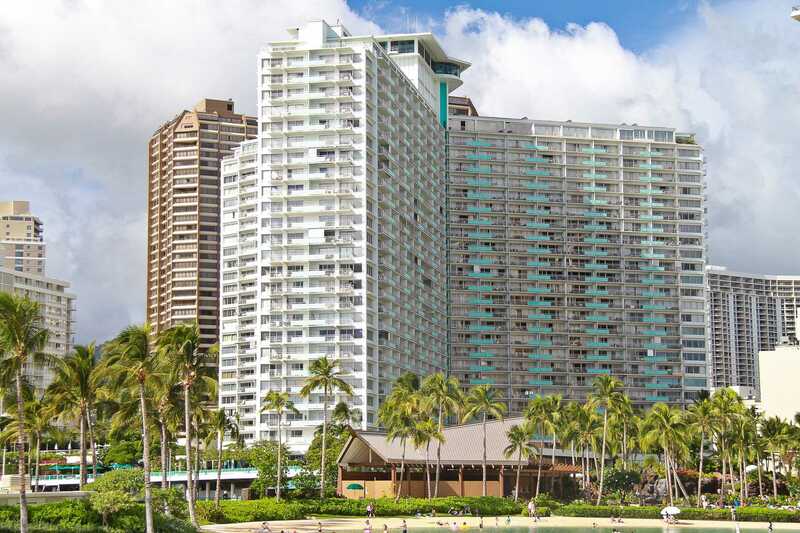 We really enjoyed being within walking distance of the beach, the lagoon, Diamond Head, historic downtown and many beaches. I searched for a long time to find the right place to stay and I found it in 1938 Ilikai. 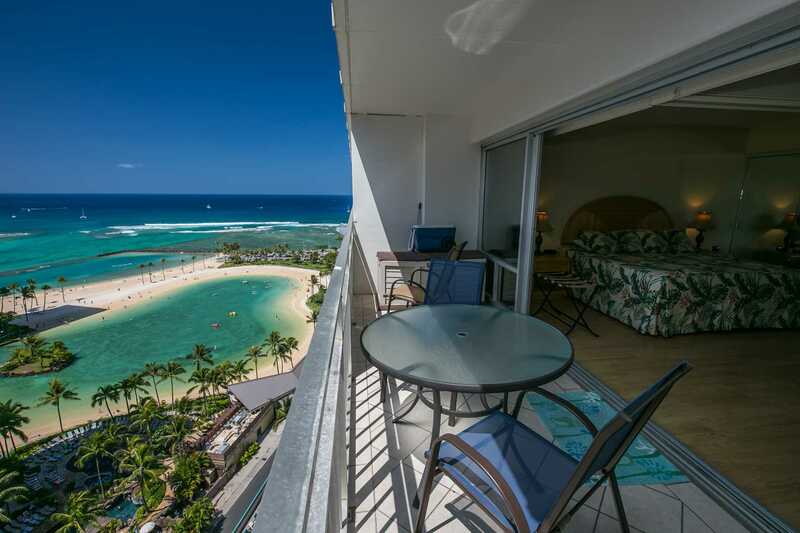 You cannot get a better view for the money anywhere in Waikiki. I loved the unit even though we stayed on the go most of the time, but when we were there it was peaceful and relaxing. The unit remodel is lovely. The location is great too; walking distance to everything you need. As others mentioned there is a slight odor when you first enter the room. It didn't bother me as I was too busy loving the view of the lagoon and ocean view. We could also see how full the pools were before heading down. I am so satisfied with my vacation and 1938 Ilikai. Thank you! Great location. Condo is well equipped, clean, bright and lovely. We would definitely stay again. Thanks so much! We so enjoyed our three week stay in February 2018 in unit 1938. We had been renting another unit at the llikia the past couple of years but decide to change as the unit was not being kept up. So glad we did as 1938 had everything we could have wanted, Nicely furnished, clean, comfortable and great views. Beach chairs, sufficient bath towels and beach towels. Bath room was spacious with great shower and lighting was nice and bright. 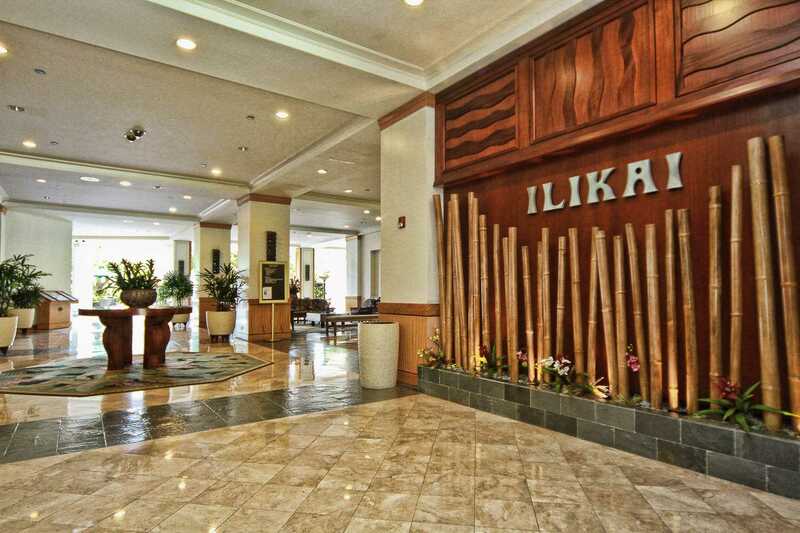 We love staying at the Ilikia as it is a perfect location to shop and walk to the downtown to dine out and come back along the beach. Hoping to return soon. Thank you for making such a nice unit available to others. Stayed here for 5 days - most importantly that view never gets old. It's beautiful even at night time. 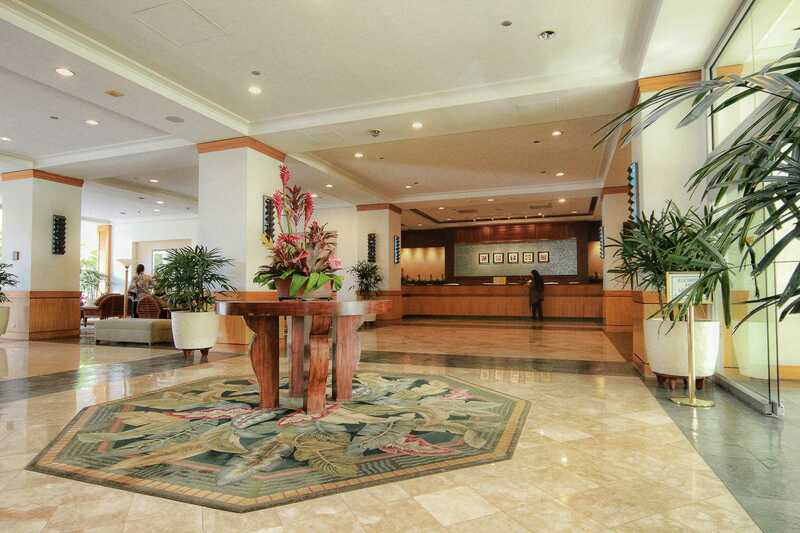 Hotel was easy to get in and out of, there are walkable spots, but it's on the west side of Waikiki. The only downside is even though it's like a hotel you don't have room service or someone coming in changing sheets/towels and giving you more shampoo/soaps. We ran out real quick. But there are W/D on every floor if you need to wash towels. Overall our stay was great! Would recommend to anyone! Aloha ! 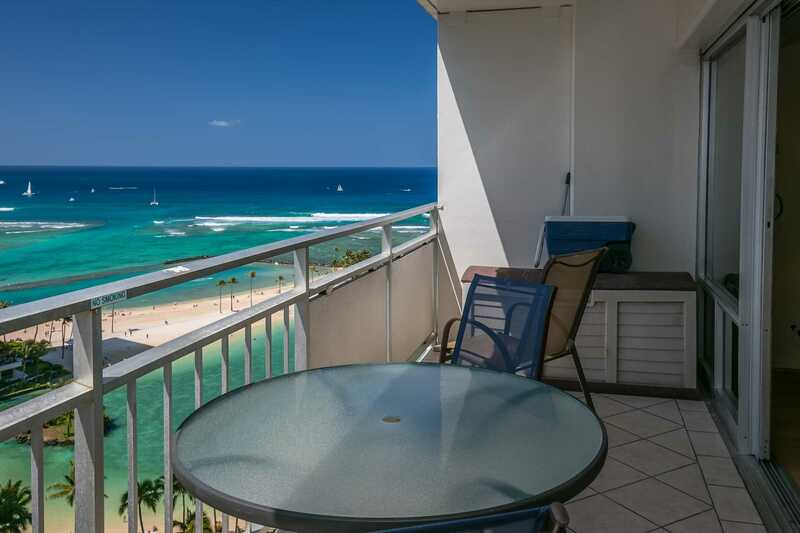 Our first trip to Hawaii was absolutely memorable ... beaches, restaurants, shopping; but the greatest attribute was the clean, well maintained, condo. 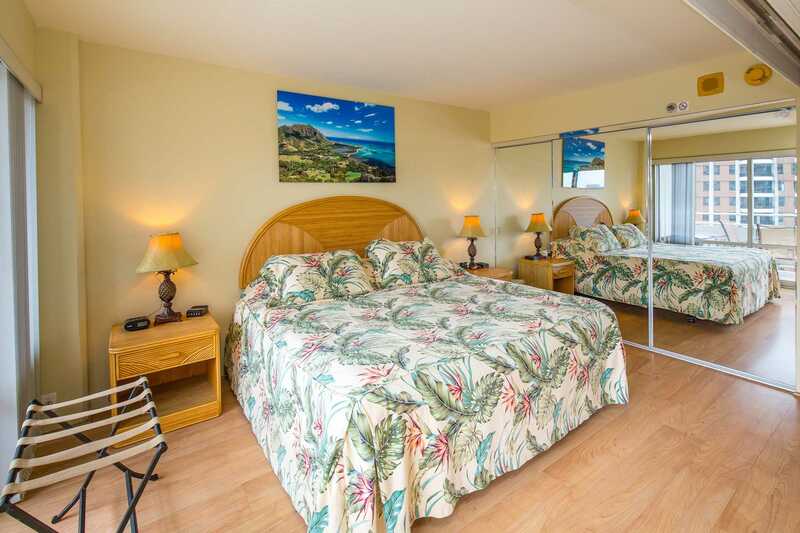 From the unforgettable lanai view of the ocean, to the accommodating staff, the condo gave a relaxing, stress free stay. We are already planning our return. 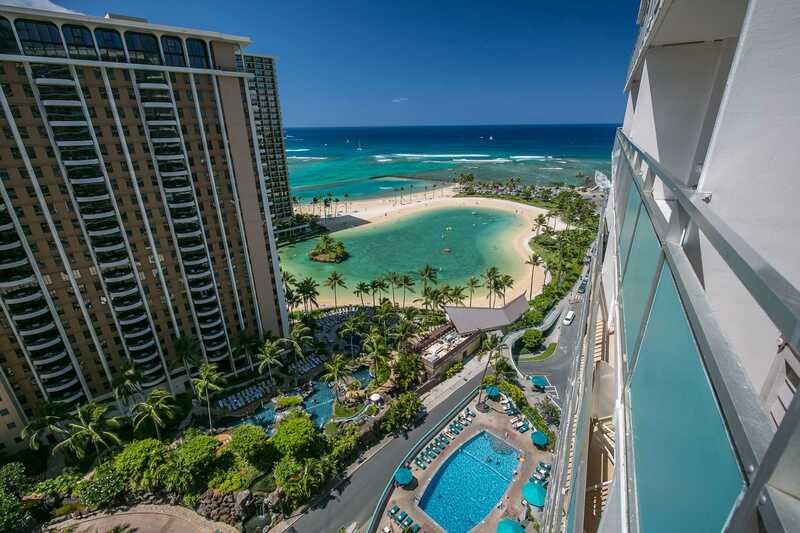 Mahalo, owners and Hawaii Vacation Properties. 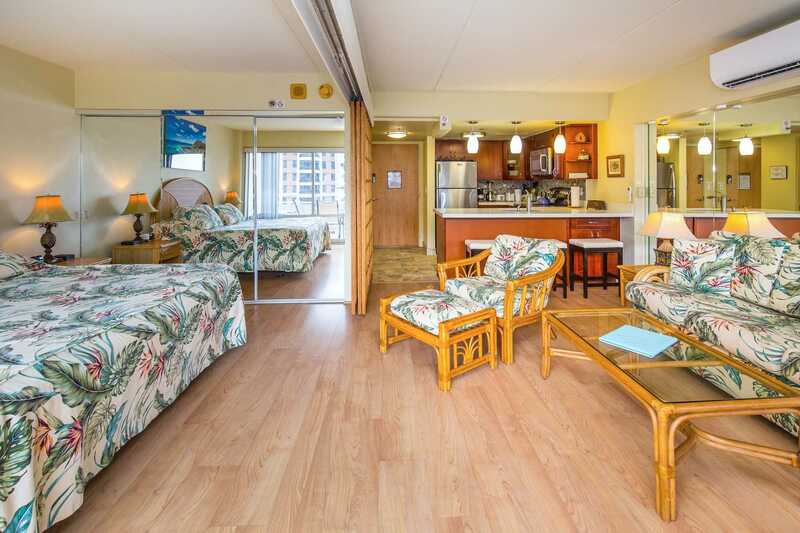 This was our twelfth holiday in Hawaii, most being in the Waikiki area and was our first time in condo style accommodation. We have been using resort type hotels on previous holidays. I found the booking process easy and seamless, we were well aware of what we had to do on arrival and to be able to go directly to our condo after our flight was a godsend. 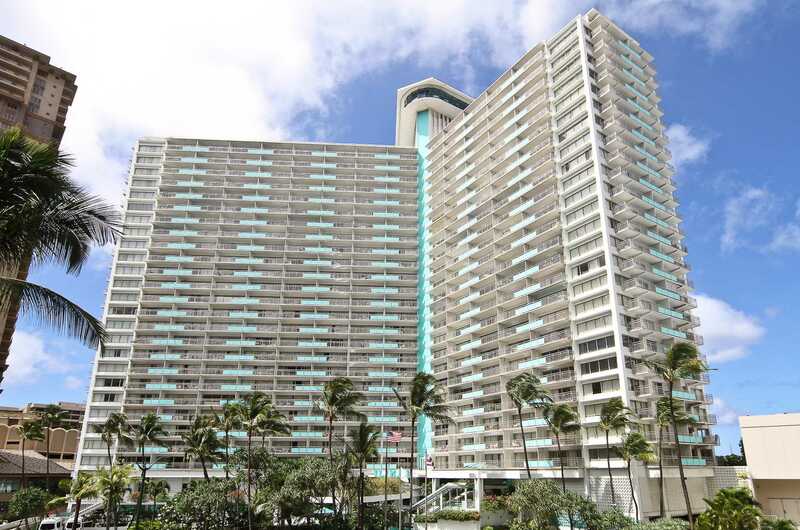 The condo is great, the facilities are great, the lanai is large and the views from the lanai are superb. We were overlooking the lagoon, the pools (Ilikai and Hilton) the ocean and the luau, great views and entertainment to while the time away while having breakfast or lunch. The Friday night firework display was superb, we watched it from the lanai and we were at eye level with the exploding fireworks, just brilliant. The owners have thoughtfully provided a box full of beach equipment, umbrella, chairs, games etc. There is no need to bring your own. 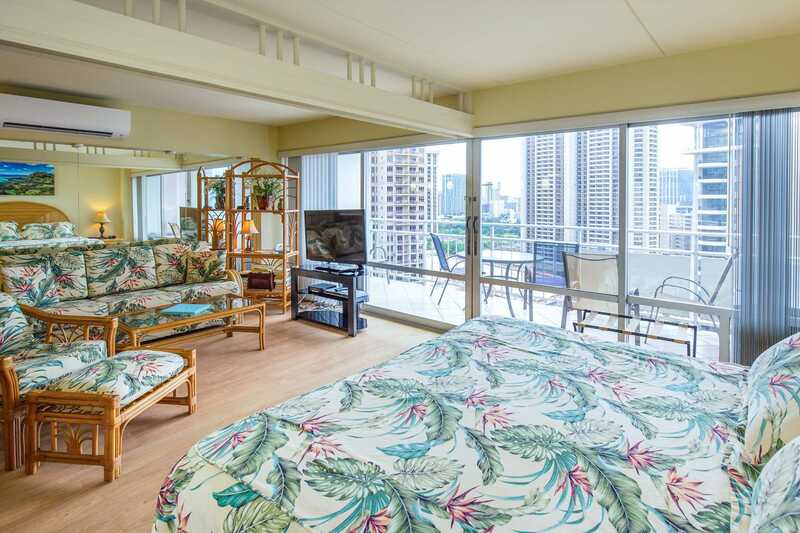 If you want ocean views, good accommodation, a well situated building, then The Ilikai and especially #1938 is for you. 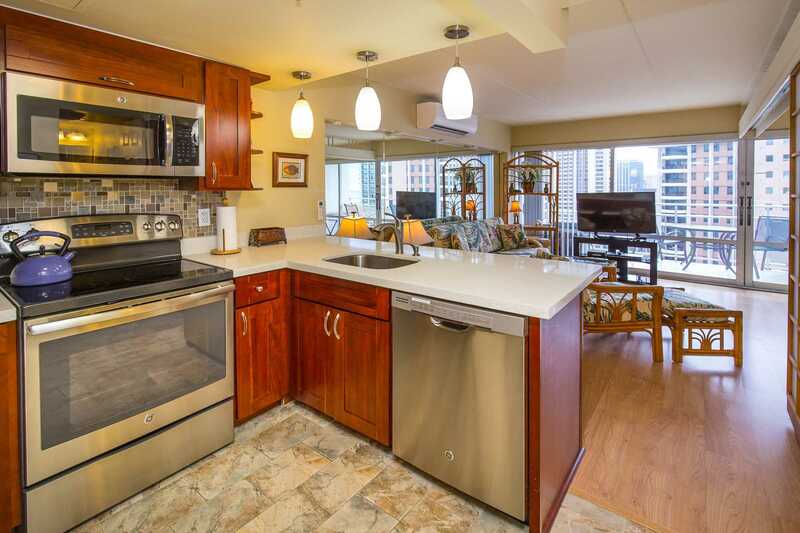 This was our fourth stay at the Ilikai but first in this Condo and third booking through Kat and her team at Hawaiian Vacation Properties who have always been professional, available and warm. 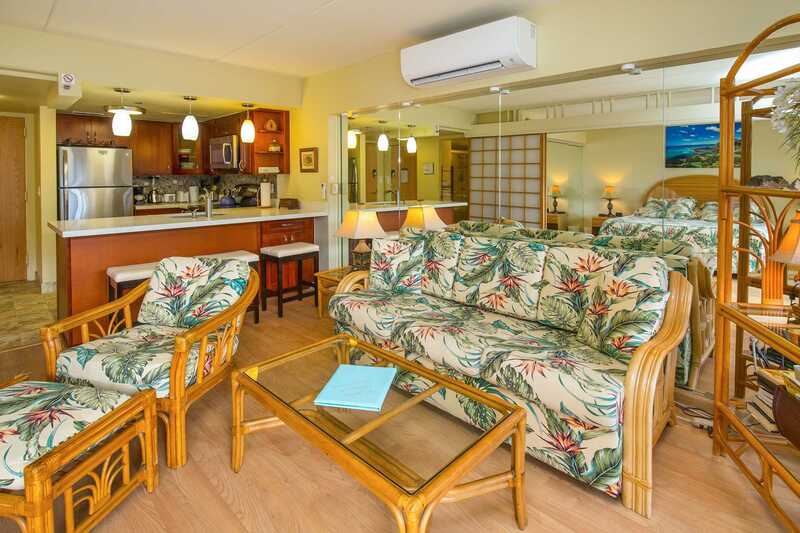 This Condo is probably the best we have stayed in at the Ilikai. The kitchen has been upgraded with a very quiet dishwasher, a fridge that really did keep my husband's beer cold and plenty of appliances to cook up a storm if you so choose. I know air-conditioners are often complained about but this one was pretty new and not only very effective, it was whisper quiet. The views from the lanai are superb and there isn't a better view of the fireworks on a Friday night than from this very lanai. The king-size bed was very comfortable as was the lounge. We will be back in September but unfortunately this particular Condo has already been booked. We had a very pleasant stay-convenient location, well equipped, quiet condo with a nice view. Mahalo! Another great stay with Hawaii Vacation Properties at the Ilikai Hotel which was our 4th stay and second in 2016. For a 21 day stay that took in the Pearl Harbor 75th Anniversary and granddaughter U of H graduation along with golf we had a comfortable stay in 1938. Updated kitchen and bathroom. 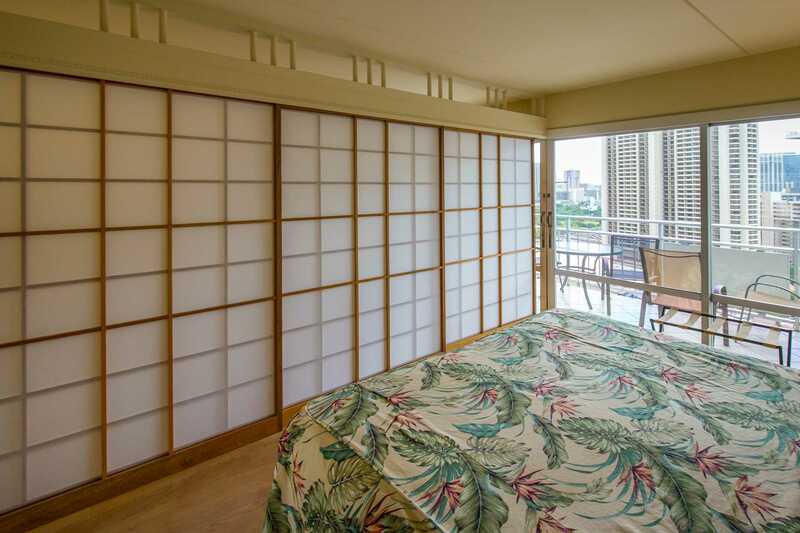 We needed a condo for 4 of us to spend our last 3 days on Waikiki. We were staying in another condo in the Ilikai so we wanted to stay on site rather than move to another hotel altogether. This cute little one bedroom condo is probably best suited for 2 people but worked out fine with a pull out couch. It's been completely updated and was very comfortable. We particularly enjoyed sitting on the lanai with our coffee in the morning and wine in the evening looking at the ocean. We wouldn't hesitate going back there again. 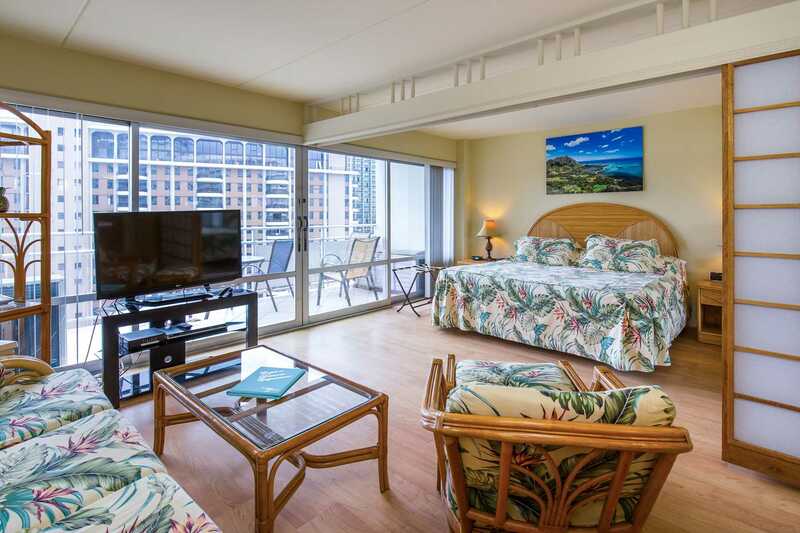 his was our 2nd stay at the Ilikai and suite 1938 was well presented had an excellent kitchen and great view over the lagoon. Having a 9 month old baby we were able to use the kitchen to make his meals, cook our own dinners and it was fairly kid safe. The air conditioning worked well and is quiet and the kitchen appliances worked perfectly. Cable TV and internet were also fine and easy to use. The Ilikai is close to a regular supermarket (Food Pantry not ABC) and gives an excellent selection of eat at home options. 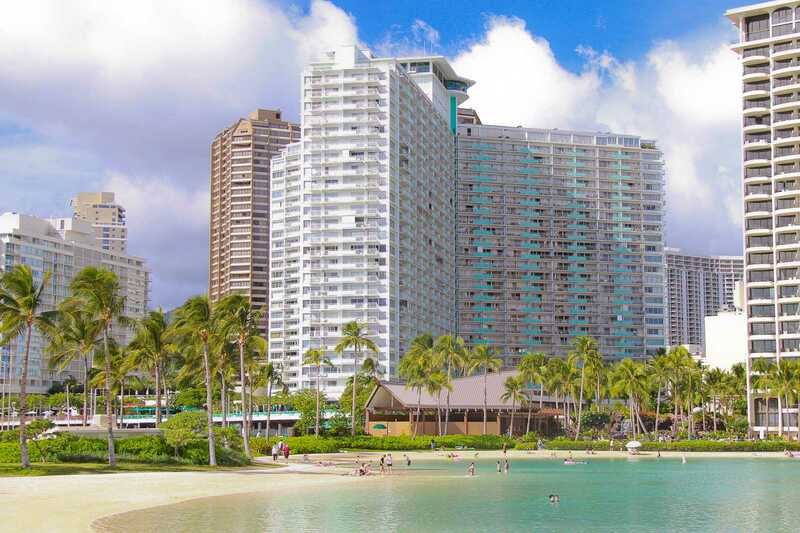 It's also a short walk to Ala Moana Mall and the beach/lagoon. Absolutely wonderful room #1938. It was in a great location and beautiful view. We didn't stay in the room much but was very clean and cozy. Everything that you could imagine to be in a kitchen was there. Beach toys were available if needed. Fireworks on Friday nights were outstanding. We stayed on the patio to watch and seen everything. I would love to stay here again! 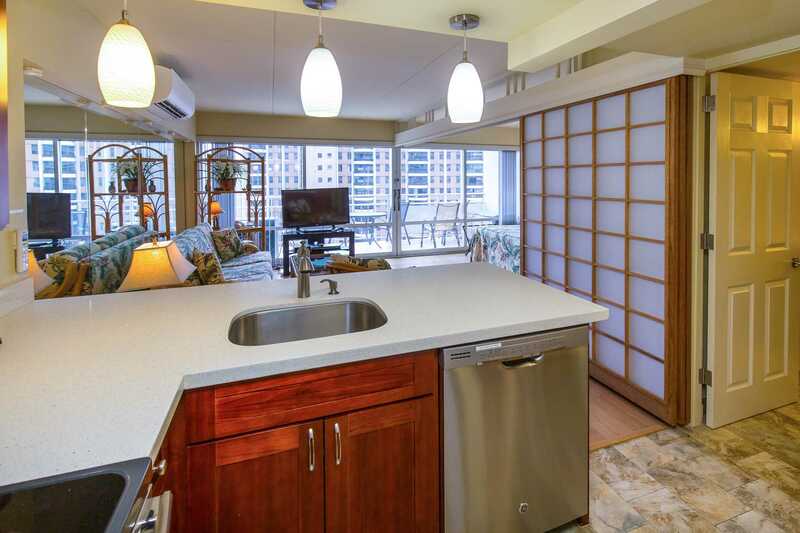 I would stay in this condo again and recommend it without any hesitation to others unless they wanted it when I did! Modern and quiet air conditioner (we call them heatpumps in NZ). Oven big enough to cook a small pig in, if that's what you wanted to cook! Quietest dishwasher I have heard ... Or not heard in this case. Modern bathroom that looked newly renovated. Newly tiled shower with great water pressure. This condo was spotlessly clean on arrival. I also liked that it was sparsely decorated. 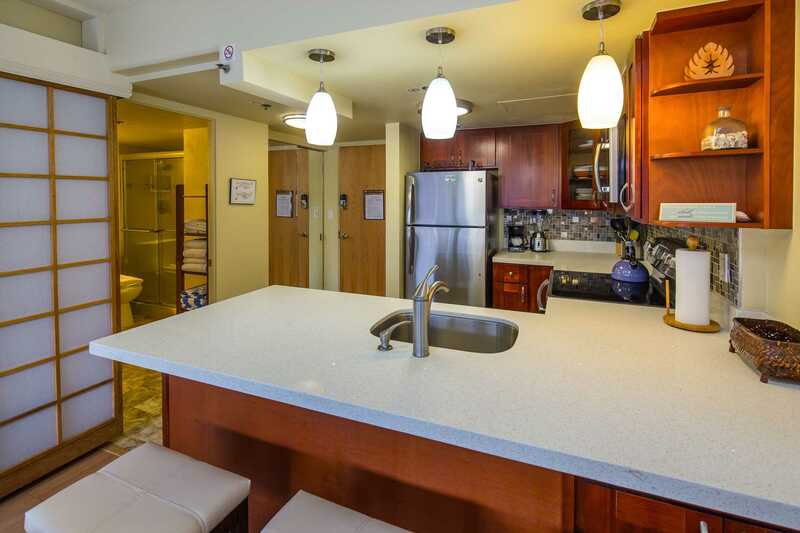 Some condos in the photos look OTT and very cluttered. This one is not. It is very tasteful. I also liked that there were a few novels on the shelf to borrow. The only thing I would change is more rotation on the TV swivel, so I could see it better from the bed! 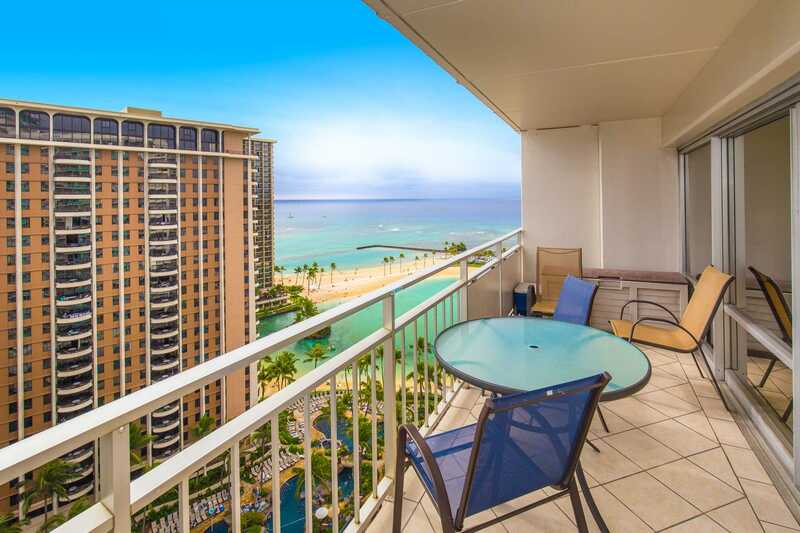 I can not fault this condo or the Ilikai (second stay) or dealing with HVP. Highly recommend this newly renovated unit with tasteful furnishings and details. 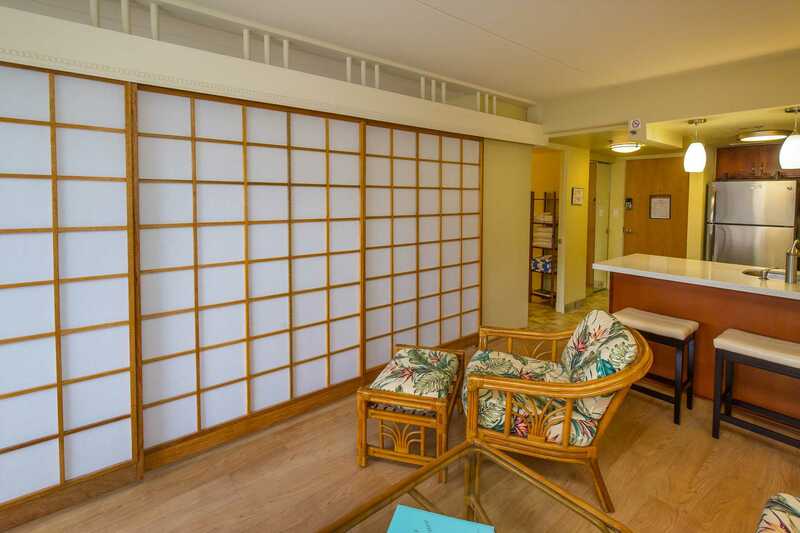 Shoji doors gave privacy from livingroom area, natural wood flooring added to light feeling. 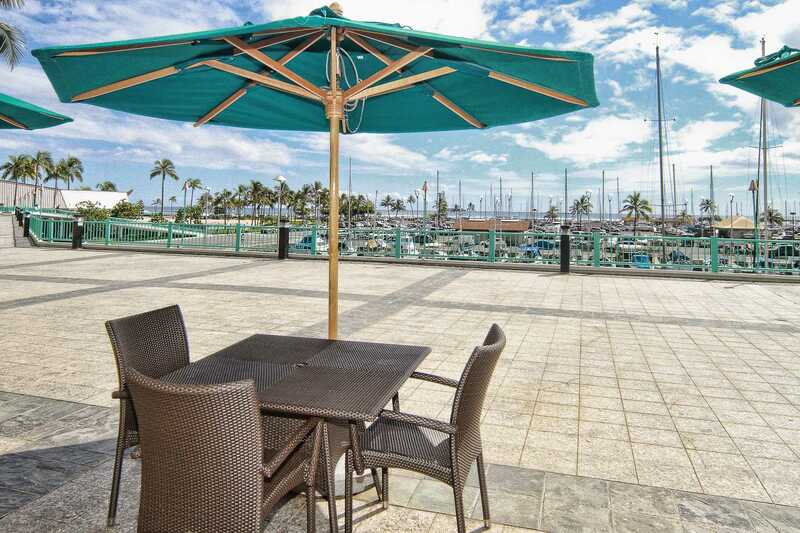 Perfect location facing Hilton lagoon and prime viewing of fireworks. Bed was exellent, although sofa bed not as comfortable for adult. New appliances, ample cookware and dishes, as well as linens. HVP contact was responsive and helpful throughout. Ilikai location is best in Waikiki - away from the madding crowd, easy to get out of the hubbub, but still part of the scene. Hourly parking always available in nearby marina public parking lot. We had a great time and would definitely return to this unit! Response: Aloha, we are happy you enjoyed your stay and be sure to check out the new pictures after the remodel is done in April. 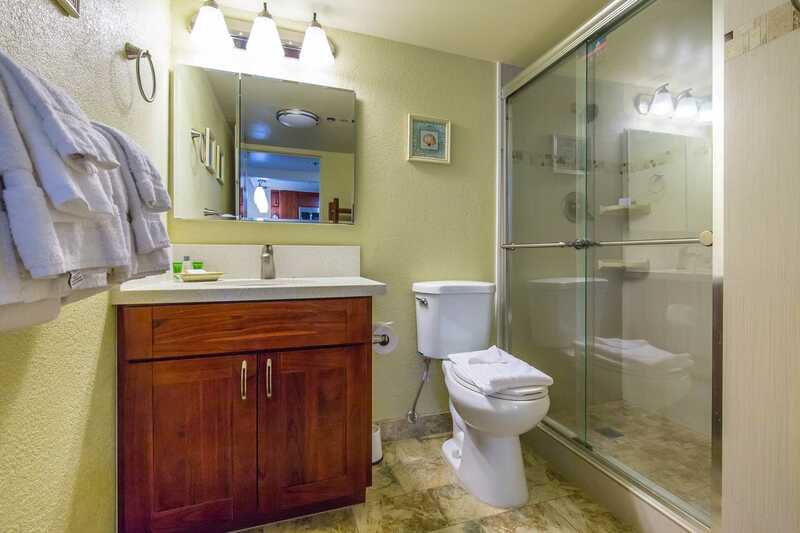 We think you will be very pleased with the updated kitchen and bathroom. Mahalo. Thank you ! Had the most wonderful 10 days in this beautiful Condo .It was exactly as the pictures showed it to be. 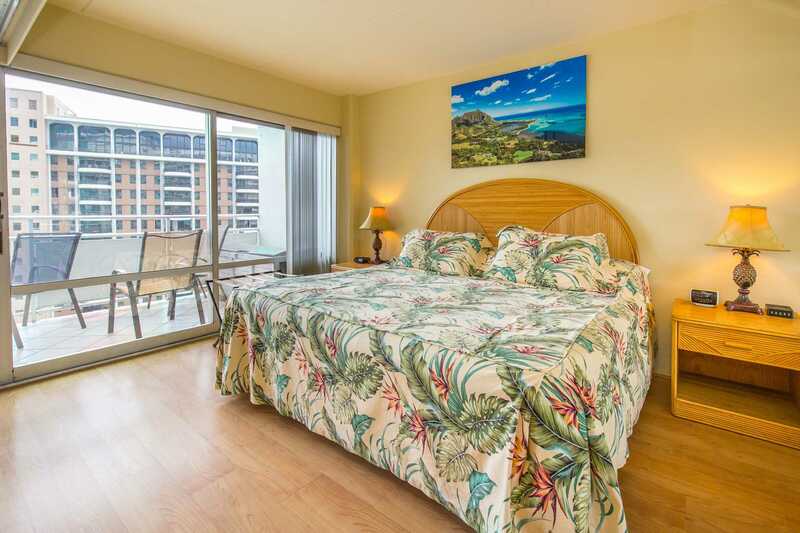 Clean with a good sized well equipped kitchen.The king bed was very comfortable , air con was whisper quiet ,All the comforts of home were at your disposal here.,The view from the lanai was amazing ! You could sit and watch the Luau at the Hilton as well as the Friday night fireworks.The view overlooked the lagoon through to the ocean. This Condo is at the right end of town. Very Quiet ,yet still walking distance to all restaurants .The bus stop is also at your front door.Loved the extras such as beach chairs, cooler bag ,boogie board, beach towels and more.Thank you Kat and owners of 1938. We will definitely be back ! This condo is amazing everything was within walking distance. The mall is only 10 minute walk. The beach 2 minute walk, ABC stores 2 minutes and all sorts of restaurants within 10 minute walk. Forty years ago we were on Waikiki beach and it's much better today. 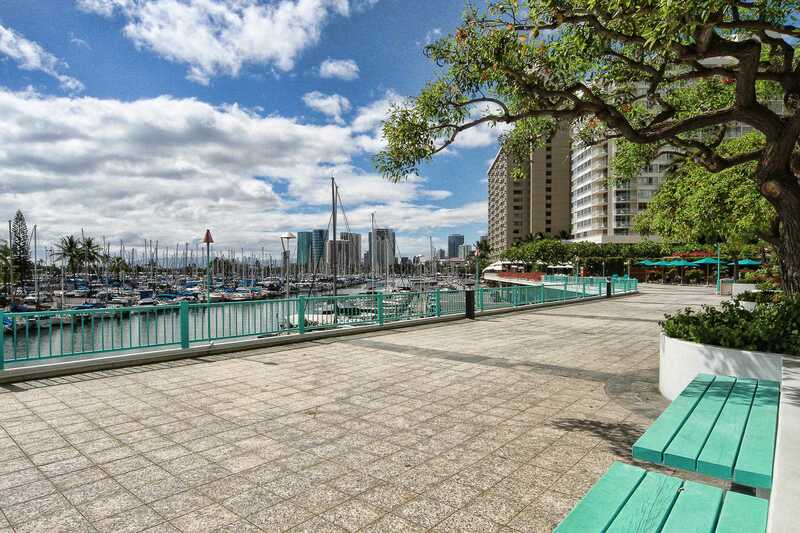 You can walk to downtown Waikiki from the Ilikai to the end of Waikiki Beach. The view from the Lanai was still breath taking. 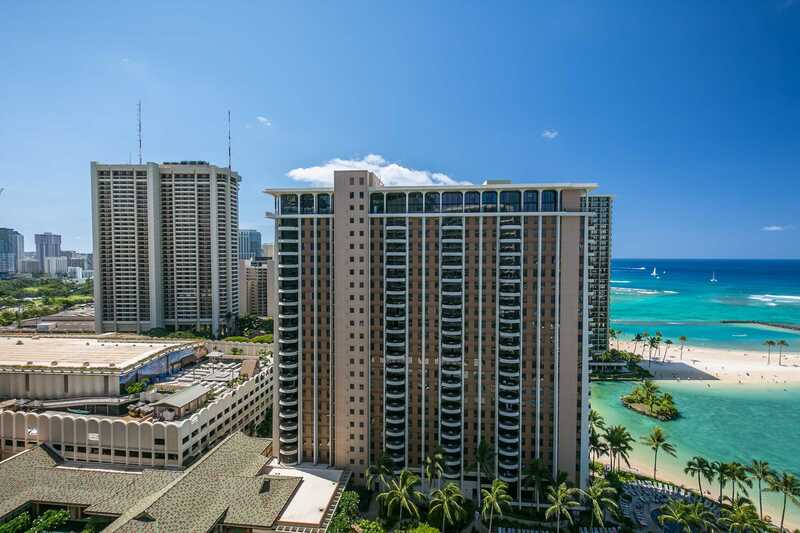 The Hilton Hawaiian Village roof top Luau and Beach Fireworks on Fridays can be enjoyed from the Lanai. 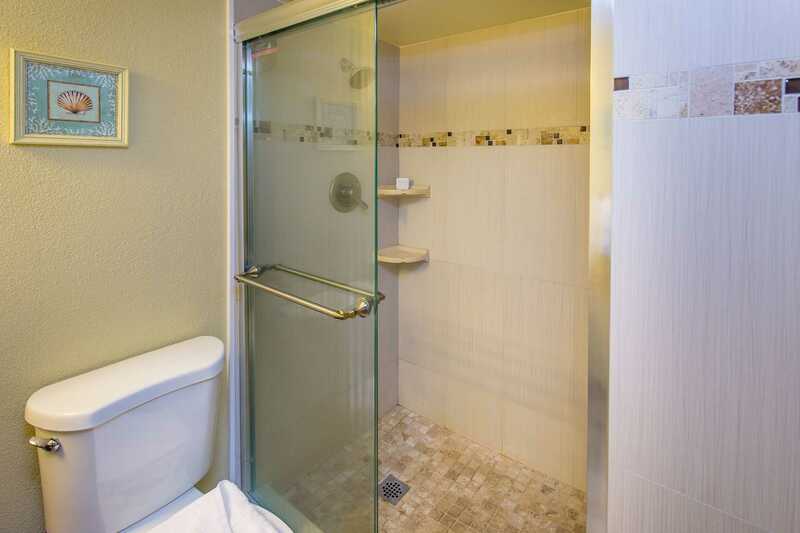 The condo is perfect for two adults. It does have the capacity to have 2 children. The condo was clean and well equipped with Boogie Boards, Cooler bag, Lounge Chairs, Beach Towels, Snorkelling equipment and umbrellas. The King size bed was very comfortable. The air conditioner was the best I have seen. You also have free Wi-Fi and long distance call to US and Canada. We really love this place and felt right at home. 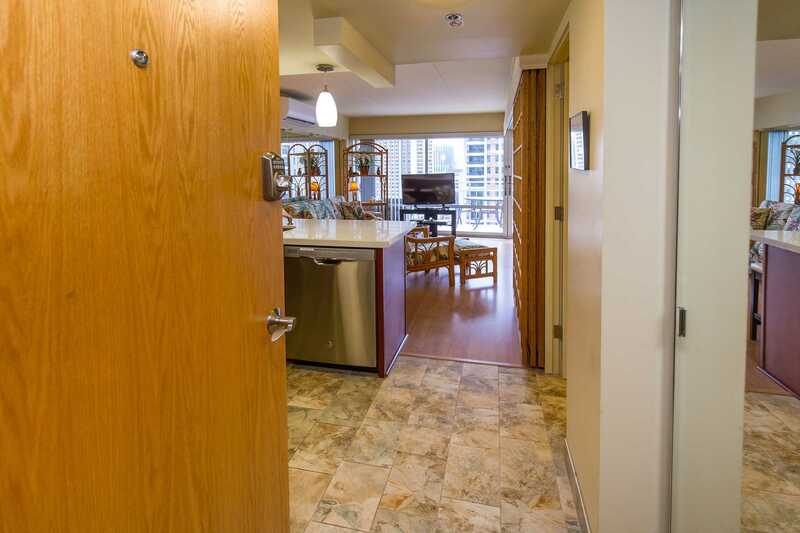 The code system for the Condo is great; you don't need to carry a card or key to enter. We would definitely stay there again. We will go back to Hawaii in 5 years to celebrate our 50Th wedding anniversary. 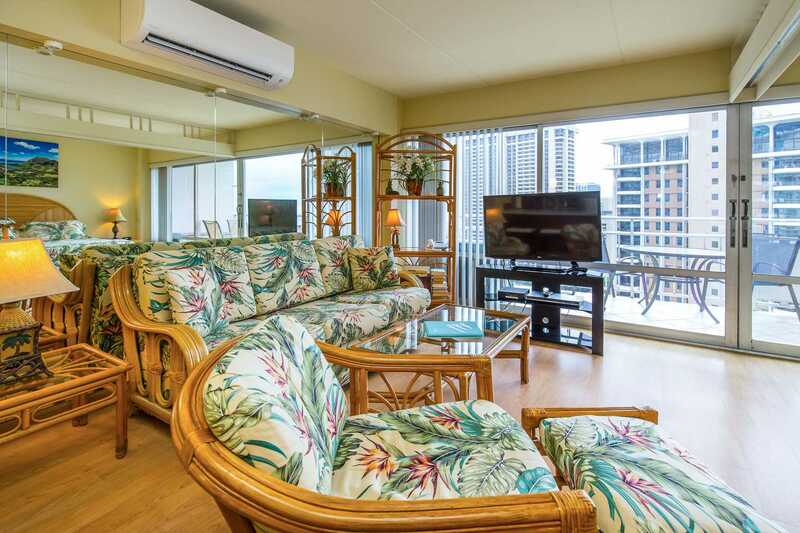 We will definitely choose Hawaii Vacation Properties LLC, and call Kathaleen to book this condo. It's very easy to communicate with Kathaleen and she is always ready to help you out. The best thing with the room is the great view ! !The room was very comfy and clean ,with all the beach toys and beach chairs it was very convenient.Would stay there again when we go back. Nice decor, with hardwood floors and with no Dining Room table, more room! The Dimmer Switch in the bathroom is a brilliant idea! The "back-pack" style beach chairs were awesome! The best air conditioner we had ever "not heard"! Free long distance option was wonderful. And the maintenance issue we had with the hard -to-open and super squeaky lanai doors, dealt with promptly and efficiently. Excellent stay, thank you! The view was absolutely breath taking!!! We weren't expecting such a fabulous view of the beach and lagoon. The location was great. 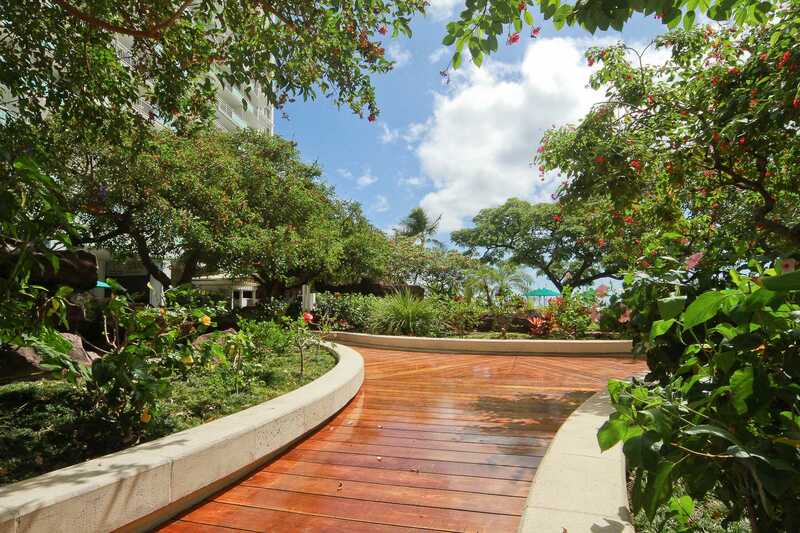 We could walk to mall and to downtown Waikiki. We would definitely stay again or would recommend it to anyone. We enjoyed our stay in Hawaii very much. The condo was nice with a good view and met most of our needs. I thought the kitchen was really small and there were no extra trash bags or paper towels. It could use some updating. The location was good and bed was comfortable. This was our first trip to Hawaii. We rented 1927 and 1938 for a week. We loved the keypad entry! After a long trip it was so nice to just walk right into our room without meeting someone to receive the key, or trekking to another building to check in, like so many other rentals. The location was perfect, we could walk to the lagoon in 2 minutes and the beach in 5 minutes. The rooms are well stocked and clean. One (1927) was newly renovated with two queen beds, 1938 was more dated, but had more storage and a dishwasher, which was nice -1938 has a king bed and a foldout couch, with a pull out room divider for some but not total privacy. The rooms were quiet, we seldom heard the neighbors. We walked to several nice restaurants and drove to Dukes, a must do! Overall a wonderful trip, and a perfect stay! 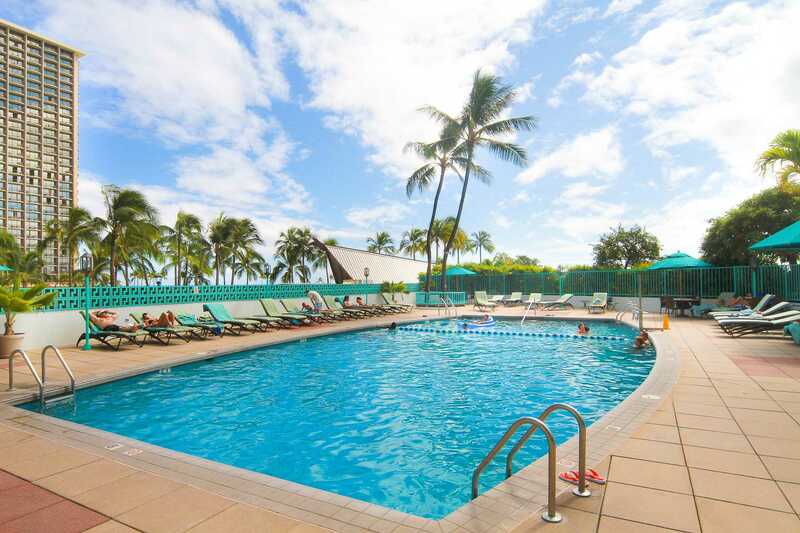 We will definitely stay at the Ilikai for our next trip to Honolulu. 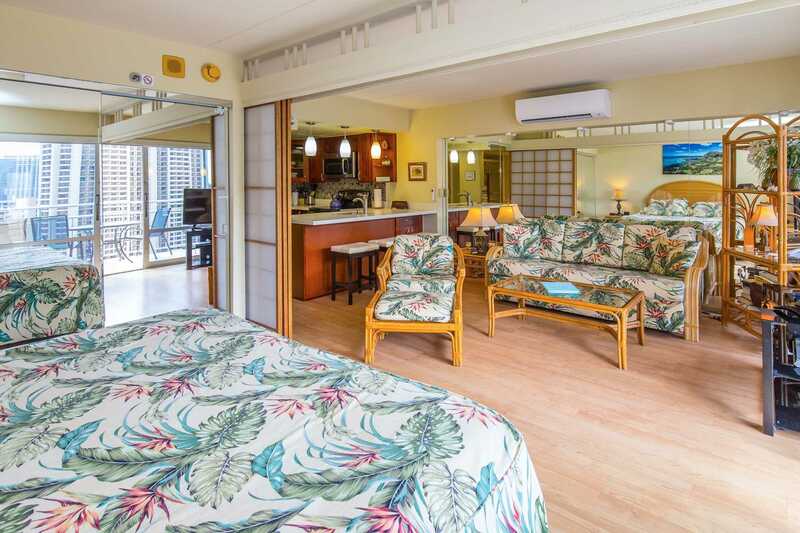 This is our 3rd stay at the Ilikai. 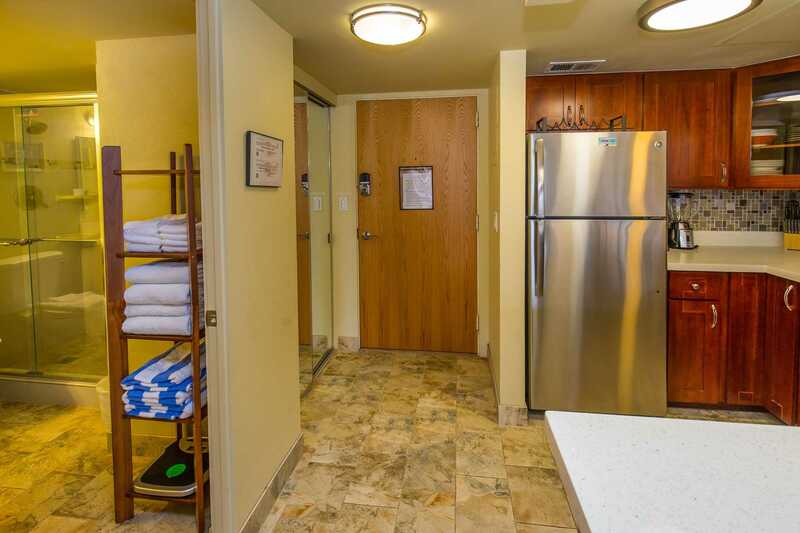 We enjoy the convenience of the location or you can rent a car downstairs if you need for the day. We enjoyed our 4 night stay here. Great view of the fireworks and ocean. 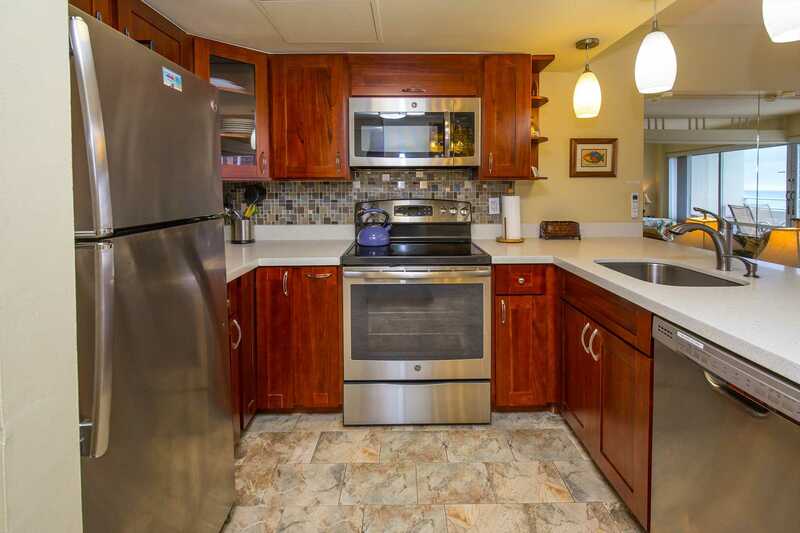 The kitchen cupboards could use updating, but overall the place has all amenities needed and was clean.